Tate Liverpool will be showcasing the largest collection of Jackson Pollock’s ‘Black Pour’ paintings ever seen together in the UK for a new show running until 18th October 2015. This is the first exhibition in 30 years to focus on this specific area of his work. The Black Pourings were part of a significant change in style for Pollock who had been working on his colourful, abstract drip paintings for the previous 4 years. During a difficult period of his life, which began in 1951, Pollock decided that he wanted a change of style and moved away from the ‘drip’ method towards the ‘pour’ method, continuing in his ‘Action Painting’ style. The works use black enamel paint poured onto unprimed canvas. His use of black can be seen as an attempt to defy critics who believed his work to be wthout substance and ‘decorative’. He would work in a barn with the canvas unstretched and spread out across the floor, approaching the canvas from different sides and angles. 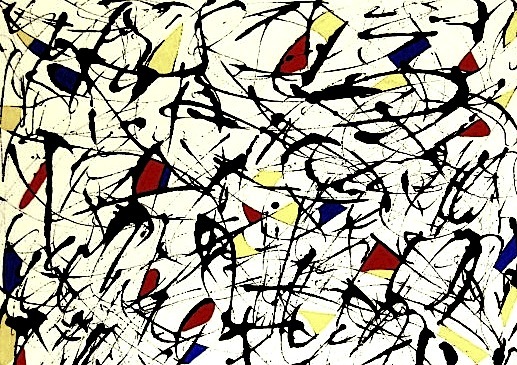 Pollock was to succumb to his addiction to alcohol, and ‘painter’s block’ followed in 1953. The exhibition also shows some of Jackson Pollock’s earlier paintings to give the viewer a broad overview of his work and a chance to see the black pour paintings in the context of his career as a whole.